Pretty much everyone wants to look good, even if it’s only about the online presence, and so do the players of World of Warcraft – through transmogrification or even wearing armor sets for pure looks when it doesn’t go to fighting. – Neophyte’s Robe: you get this by creating a night elf priest and sending the starter chest armor to the character you want to have it on. – White Swashbuckler’s Shirt: every tailor can make one, so it’s easy to look for a crafter or to check the auction house (the latter is the most expensive in my experience, unless it’s a lucky day). It’s pretty much replacable with a shirt of any kind depending on preferences, for a more classy look a Formal White Shirt looks pretty good, or an Orange Martial Shirt fits the orange of the dress itself well in my opinion. 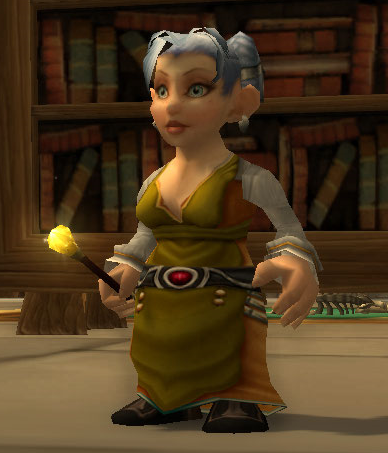 – Silver-Thread Sash: This item is probably the hardest to get, I got lucky and found one while levelling with Teribeth, but sometimes I buy parts of the silver thread set from the auction house. It’s rather expensive, but I love the look. For saving money it can be replaced with everything that looks good, maybe something simpler or in a colour complimenting the dress. – Archivist’s Lighter: This is a wand I got as reward from a quest in duskwood, it’s a chain that starts with ‘The Legend of Stalvan‘. This entry was posted on Friday, July 12th, 2013 at 01:58	and tagged with armor, Roleplaying, world of warcraft, WoW and posted in Armor Sets, World of Warcraft. You can follow any responses to this entry through the RSS 2.0 feed. « Getting started with blogging: What is this all about?